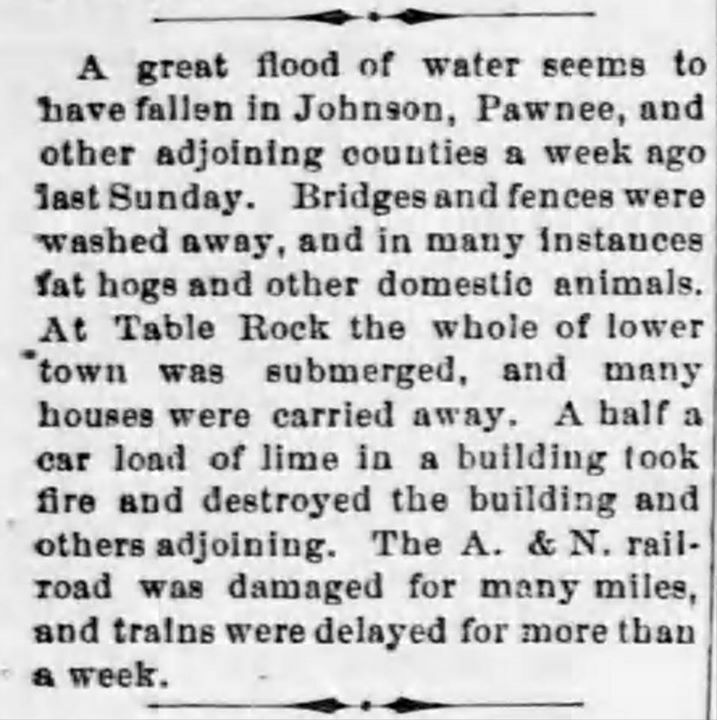 Reported in a paper other than the Argus, which was not founded until1882, "many houses were carried away" in this May 1876 flood, and half a railroad car of lime caught fire. 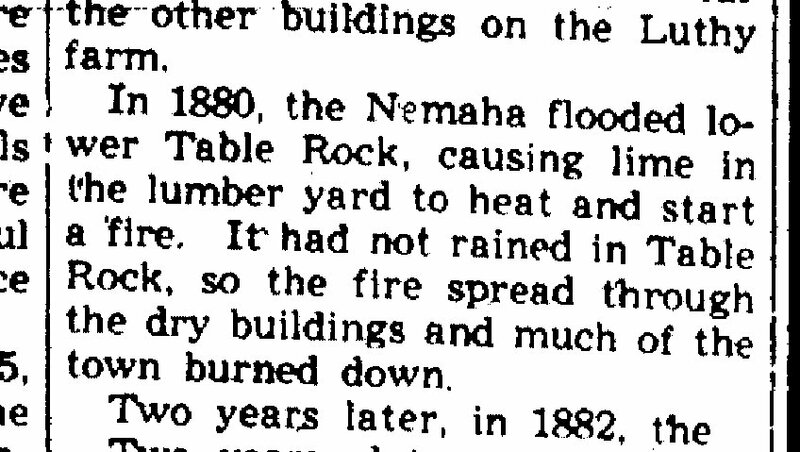 a mention of an 1880 fire -- intended to reference the 1876 fire? 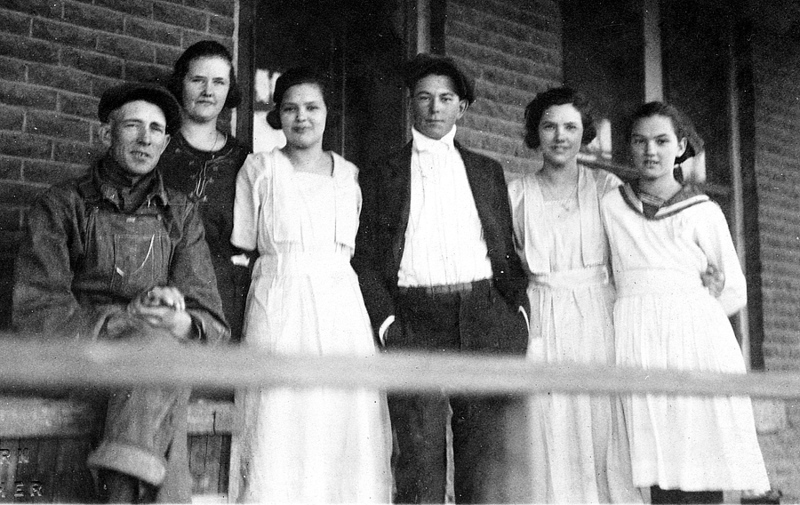 In 1957, Nettie Stehlik wrote an extensive history of the Pleasant Valley Country School. 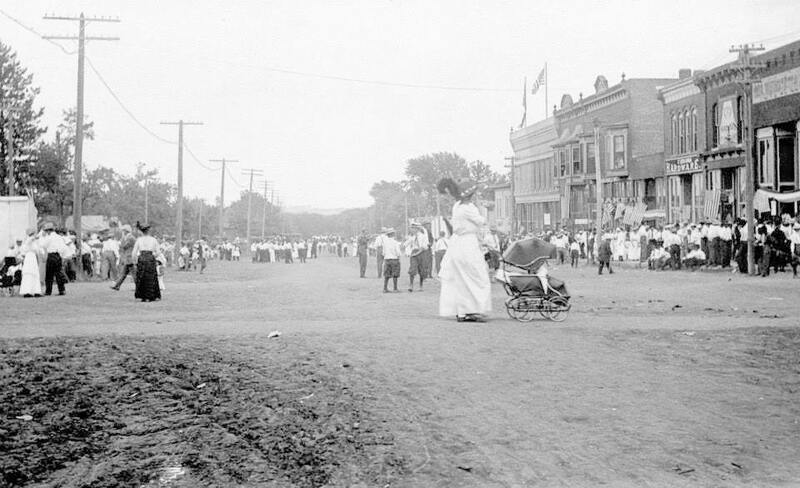 It included much local history for context. 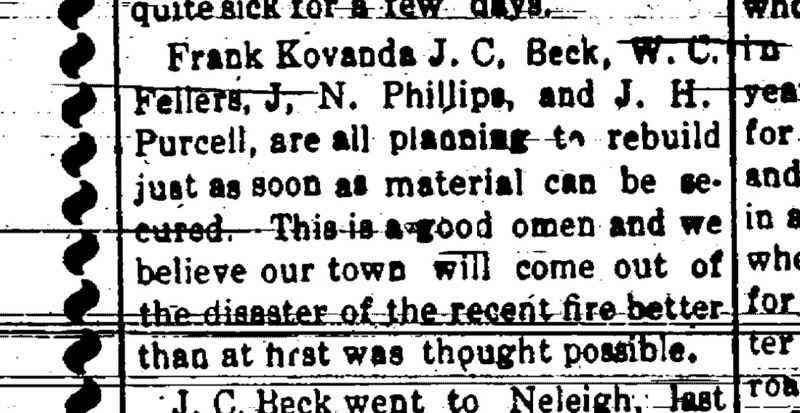 In the July 4 installment, she mentioned the fire of 1880, which burned down much of Lower Town. 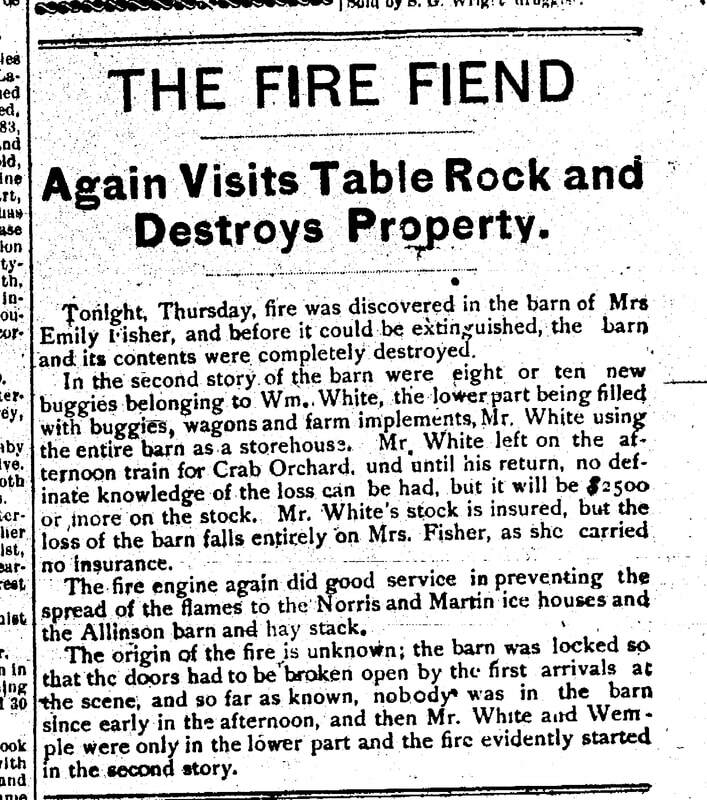 It may be that the subject was to the 1876 fire, given the reference to a fire caused by lime. 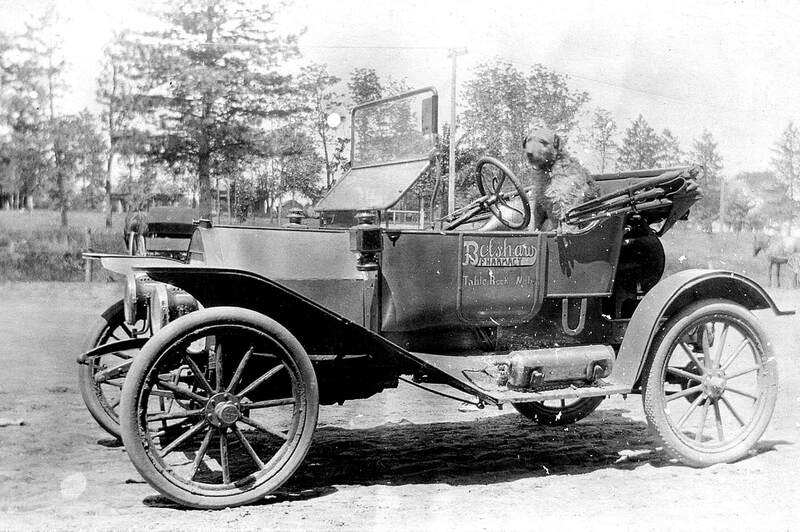 Delivery car for the Belshaw Pharmacy, where the fire began. Thanks to Betty Ann Wilkins for sharing this unique photo. Some newspaper articles five years before the fire -- all on October 29, 1915 provide some interesting context. For example, the big fire in 1926 began in the Belshaw Pharmacy. They did not know the cause. 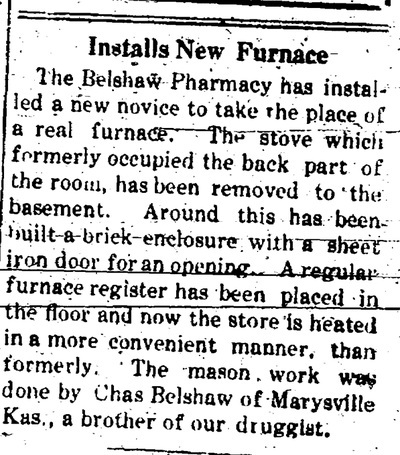 Curiously, five years before the 1920 fire, the Belshaw Pharmacy had a new-fangled furnace installed. 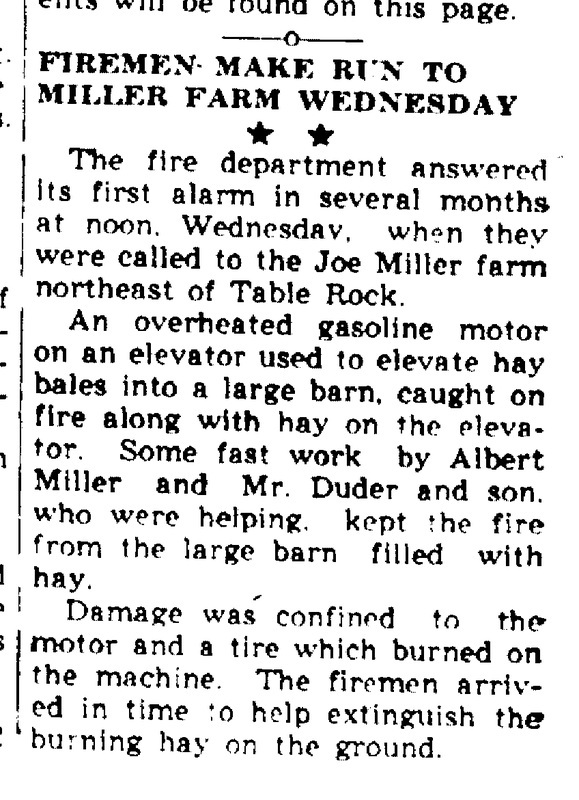 Ironically, school children were taught fire prevention, in part so they could bring that knowledge to the business world to decrease the "great unnecessary fire loss." 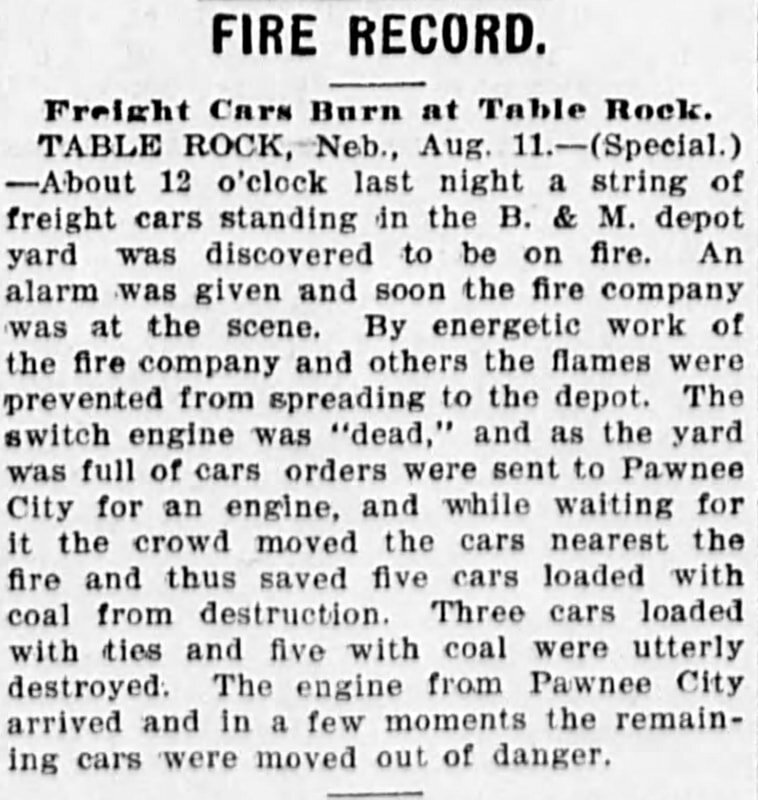 The Table Rock Volunteer Fire Department was quite excited that they might get a chance to fire a "real fire," hooked up their new "chemical" engine to a car, and drove "at the rate of nearly 30 miles an hour" toward Dubois, until meeting folks who gave them the news that the fire was already out. 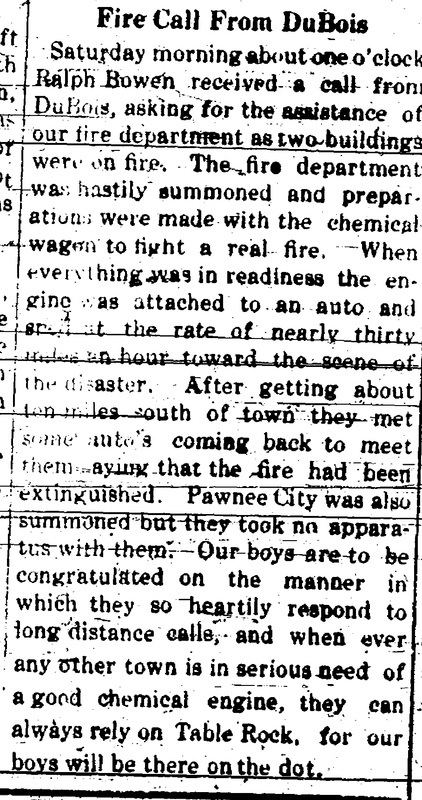 The volunteer fire department's pride in its chemical engine aside, the volunteers reportedly became lax during WW1 and after. 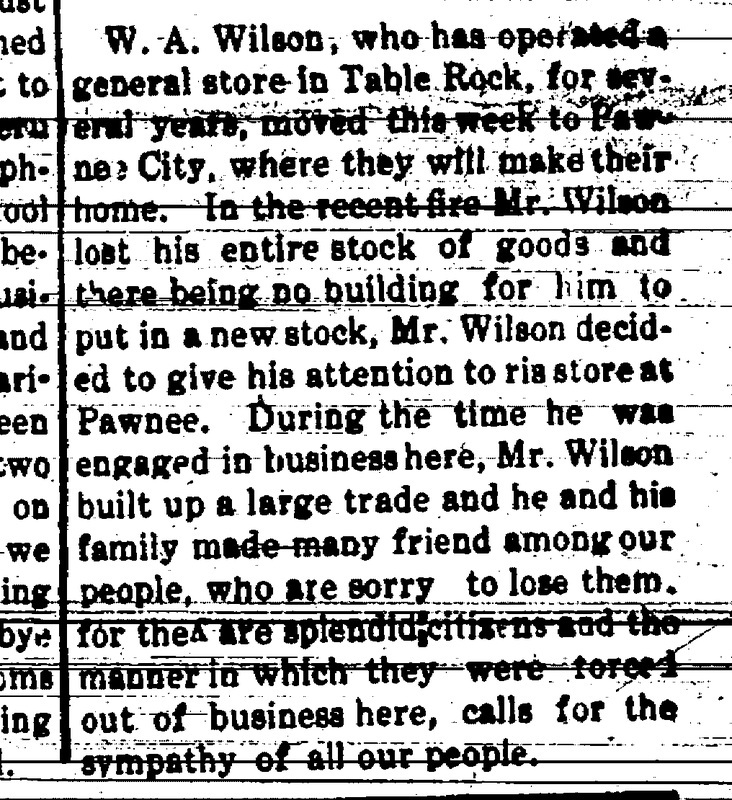 On the night of February 5, 1920, folks went to bed with their town having quite a number of thriving businesses. Many were located on the South side of the Square, west of the new Lincoln Hotel Block. 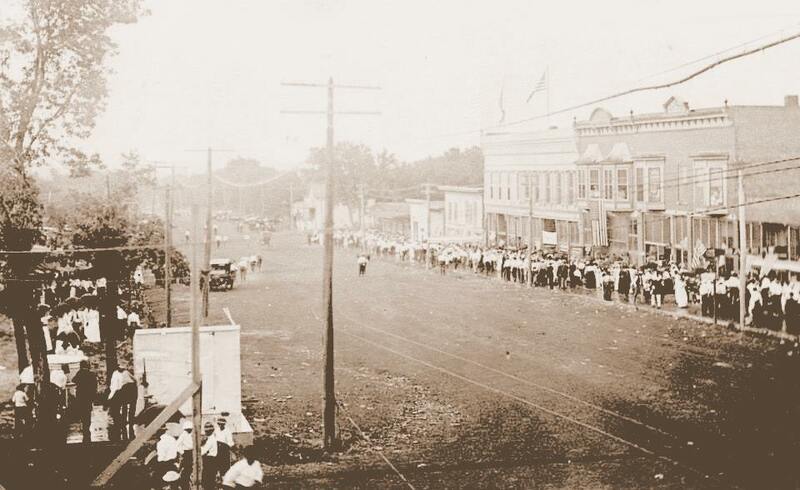 That "block" of buildings -- the hotel, theater, and a retail store -- had been built in 1916 - 1917. On the East end was the new Lincoln Hotel Building Block built in 1916, a complex which included a hotel, a theater, and a store building. 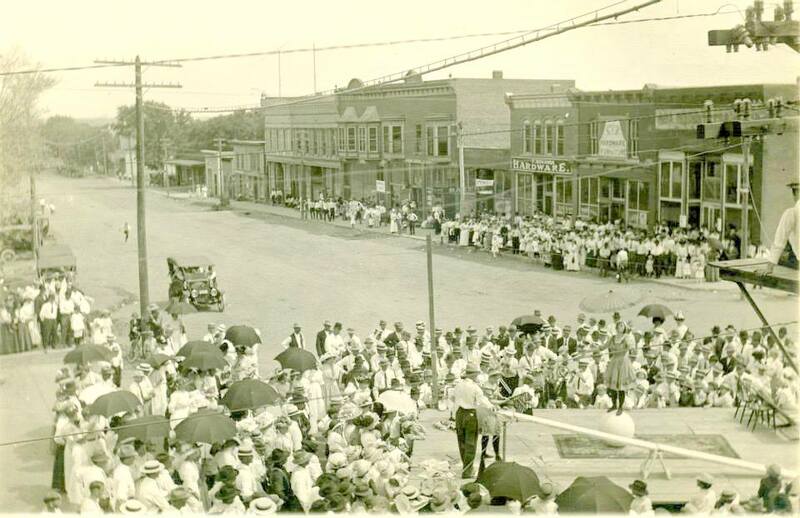 On the west end were the two buildings now occupied by Table Rock Electric and the Argus Museum of the Table Rock Historical Society. The former was the Richardson Building, the latter was the Taylor Building. Both were built in the 1890s. Between were a variety of buildings, six of brick and others frame. 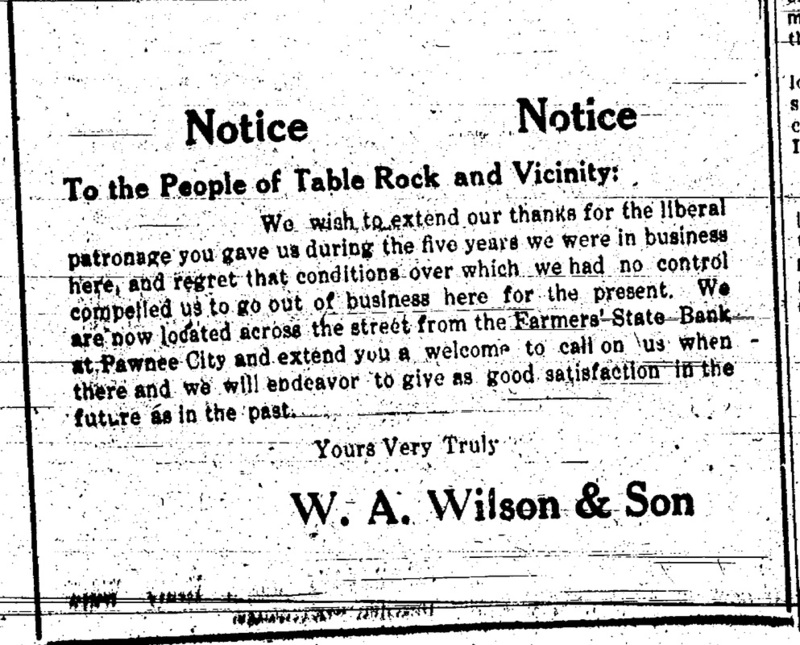 1) The W. H. Wilson “Block,” a building with multiple establishments and a living quarters. 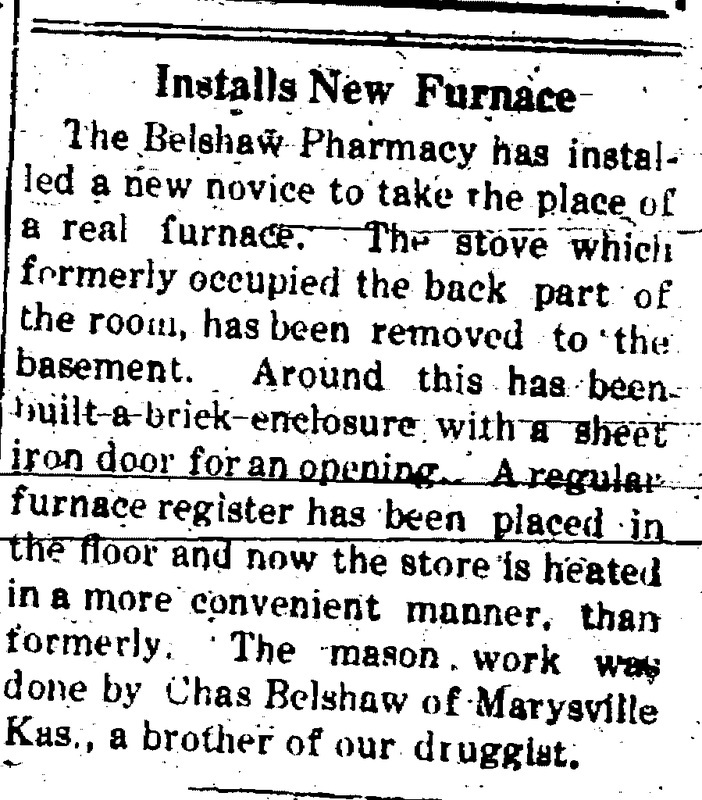 On the ground floor, on the east and west sides of it were the Belshaw Pharmacy -- which often advertised goldfish for sale -- and the Basket Store. 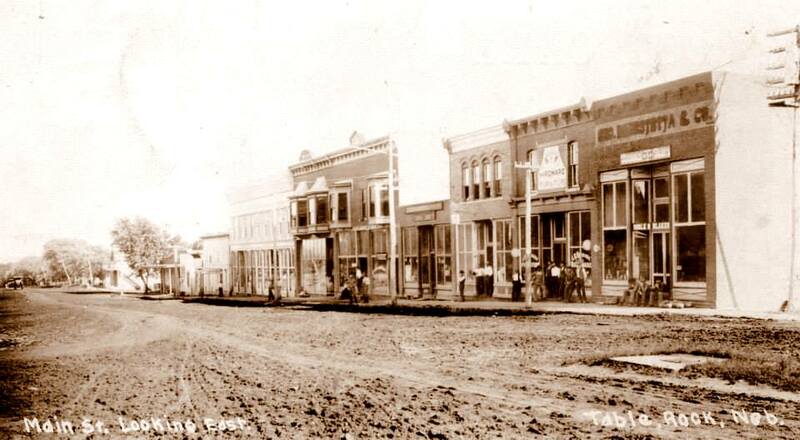 R. C. Cotton had a jewelry store within the Belshaw Pharmacy but was in the process of moving to the block west of the south side. James Walker lived on the second floor of the Wilson building. 2) To the west of the Wilson Block was the Frank. Kovanda building, which was occupied by Norris Aylor’s store. 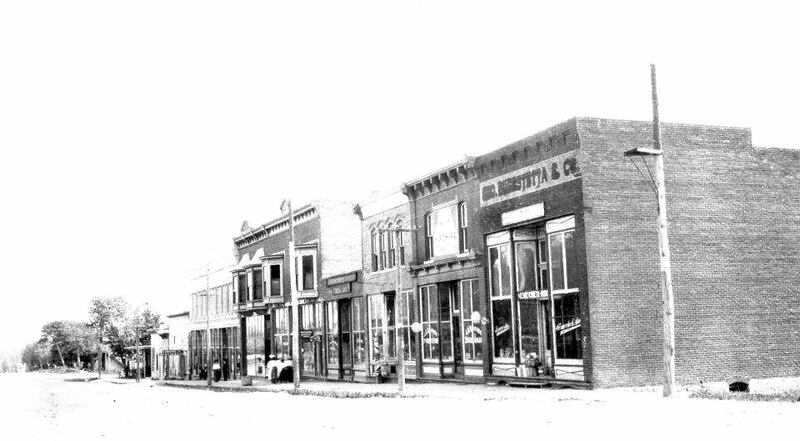 4) The Beustett Block, a building that contained Wilson’s store on the first floor, and a lodge hall (the A.O.U.W.) on the second floor. 5) The Purcell Block, a building that had J. L. Fulton’s billiard hall on the first floor, and the Belshaw Hall above. 6) The J. C. Beck building, which housed J. B. Carter’s store. 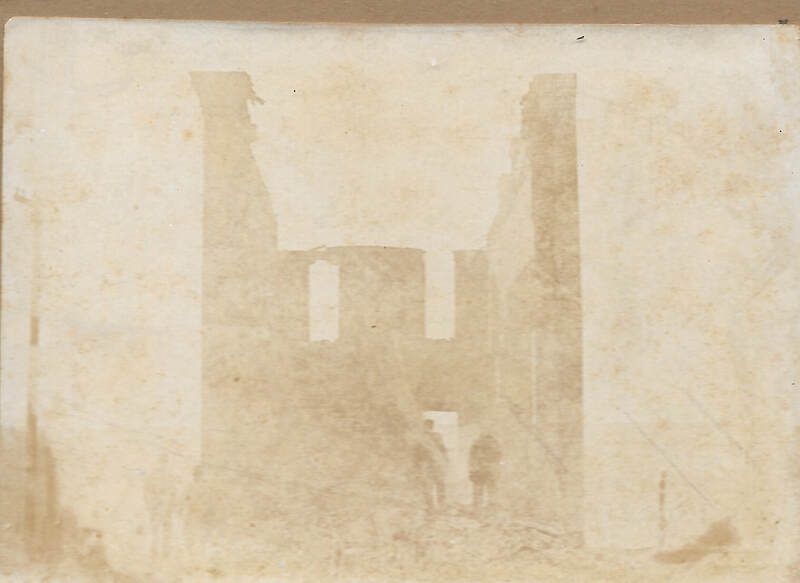 There were three frame buildings. 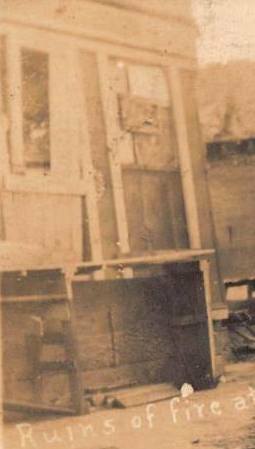 1) A building owned by Mary Chandler of Steinauer and occupied by the Frank Sherman Barber Shop. 3) A building owned by F. A. Steah and J. N. Phillips, which may have been unoccupied. 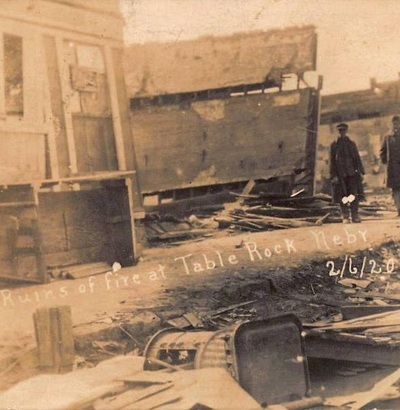 All of the buildings between the Lincoln Hotel Block and Table Rock Electric were lost in the fire. The people of Table Rock went to bed with a block of businesses and woke up – if they slept through the hubub -- to rubble. The six brick buildings in the middle of the block burned overnight. 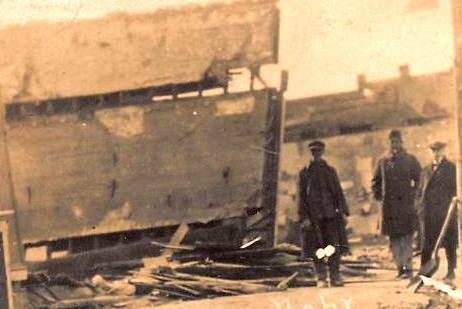 The frame buildings of Chandler and Tenk had been torn down (some say dynamited) to keep the fire from spreading the Lincoln Hotel Block. The frame building of Steah and Phillips was standing at day break, but at Noon, the west wall of the Purcell building was dynamited and fell on it, crushing it. Within the year, four buildings had returned. In the middle of the block, Jim Purcell rebuilt. He had a general merchandise concern. 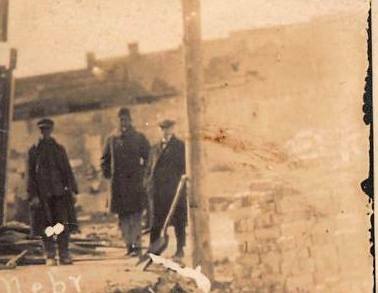 The building was later occupied on the east side by Karas by Knapp’s Grocery Store and Vrtiska Electric. West of Purcell, on the other side of a fire hole, J. C. Beck rebuilt. 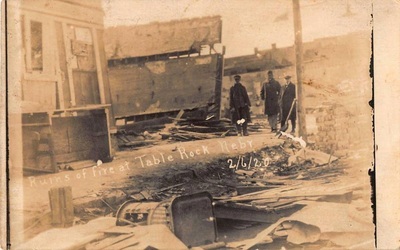 That building was most recently occupied by the Saddle Rock Tavern. West of Beck, Frank Kovanda rebuilt. 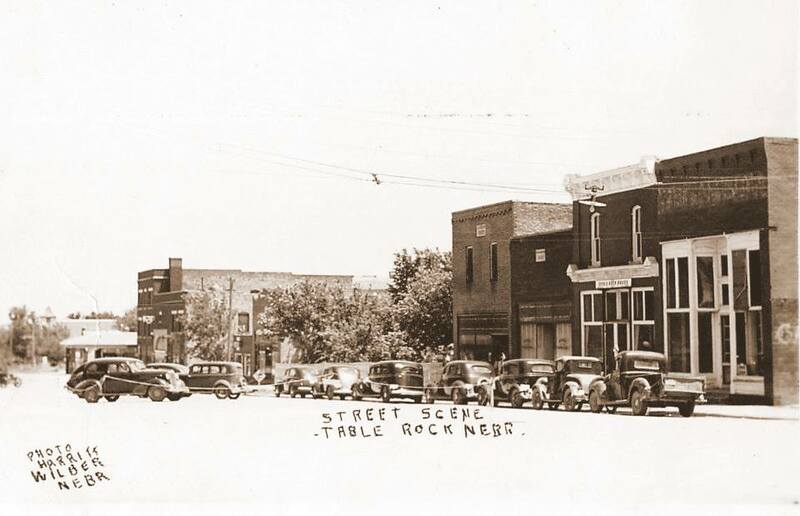 That building was occupied by a mortuary for many years, but most recently the Saddle Rock Tavern extended into it. 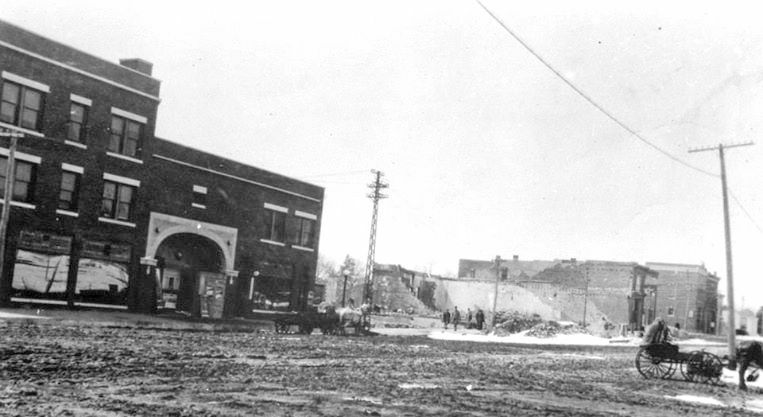 After many decades, the Table Rock Apartments, the Post Office, and the Telephone Building were located in the fire holes on either side of the Purcell Building, and a small building was built onto the east side of the Purcell Building that once housed Jim Karas’s welding shop and later John Kolacney’s business. 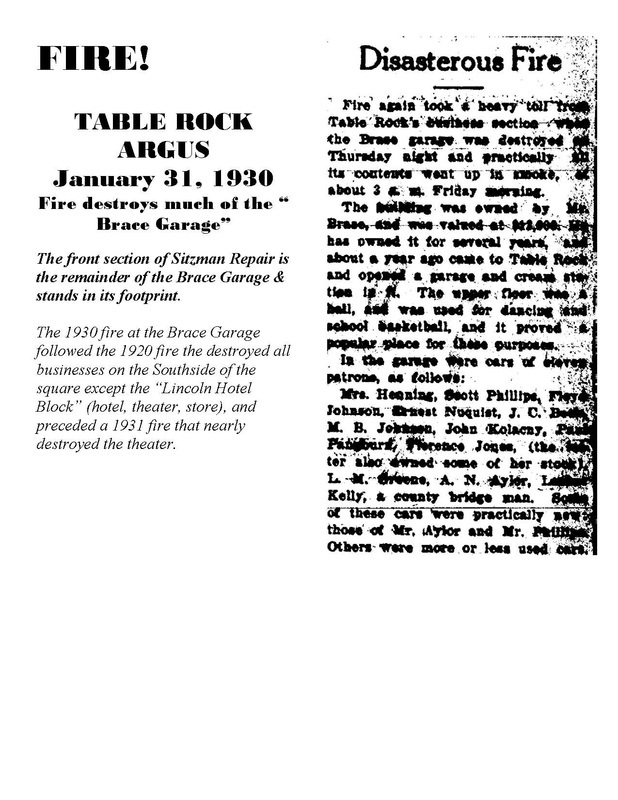 The February 7, 1920 edition of the Argus carried a front page story. The PDF of that article is very difficult to read. However, it was reprinted in the Argus on the 40th anniversary of the fire in 1960.
after the rebuilding, the south side square remained incomplete for many years. Photo 475. 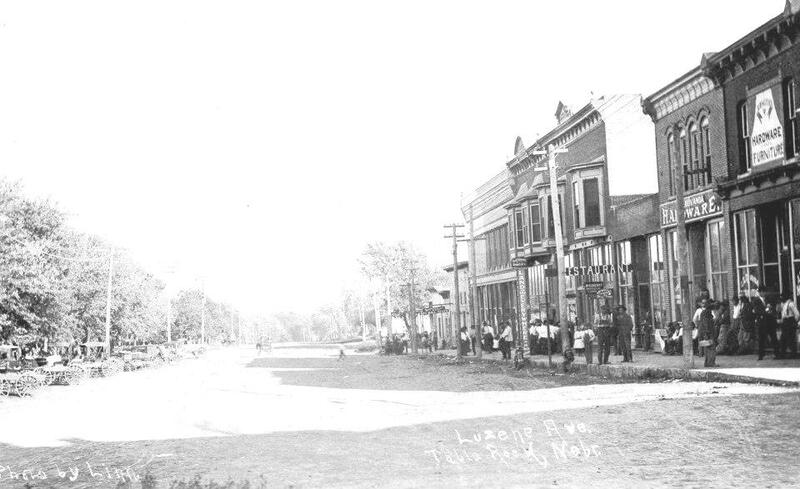 Purcell's store can be seen in the middle of the block, between groups of trees. There is a small building attached to it, believed to have been built by Rudy Karas as a blacksmith shop. In the foreground are the two buildings on the west end of the street that survived the fire, the buildings rebuilt by Kovanda and Beck, and, the Purcell store. 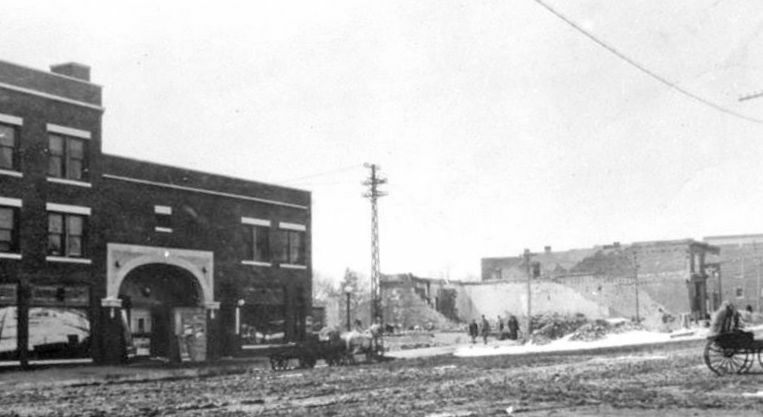 The Brace Garage was a two-story brick building, with a residential apartment over the office and show rooms in the front. It had previously been used as a livery, then converted for use as an automobile repair garage and creamery. Later, Rudy Karas operated a garage and sold cars for many year. The garage currently houses Sitzman Repair. All that is left is the two-story portion with the second-floor apartment. 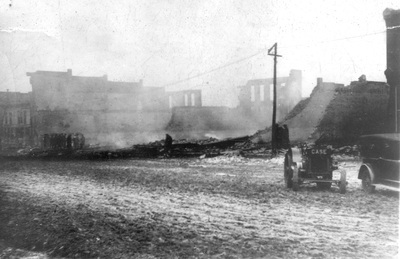 After the 1930 fire, the second story behind the residence was removed. 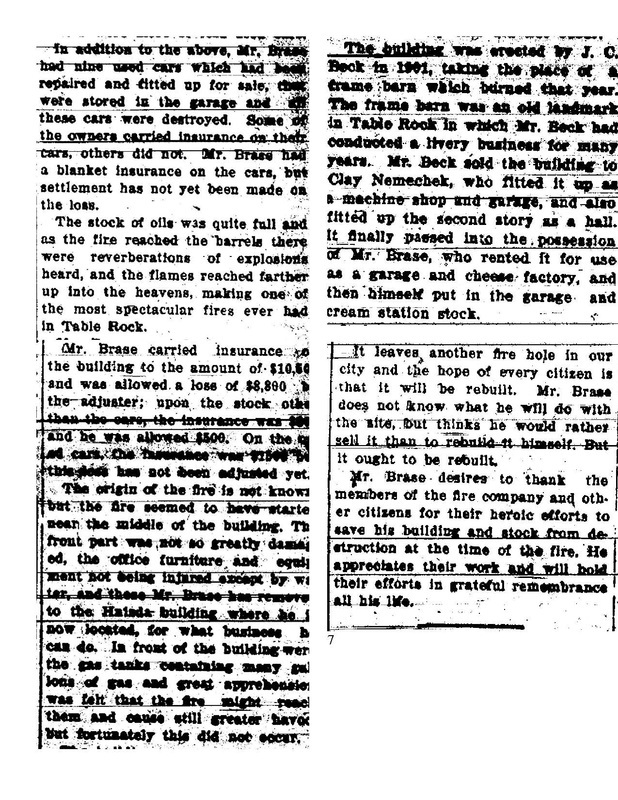 On February 1, 1989, another fire occurred which wiped out that first floor as well. 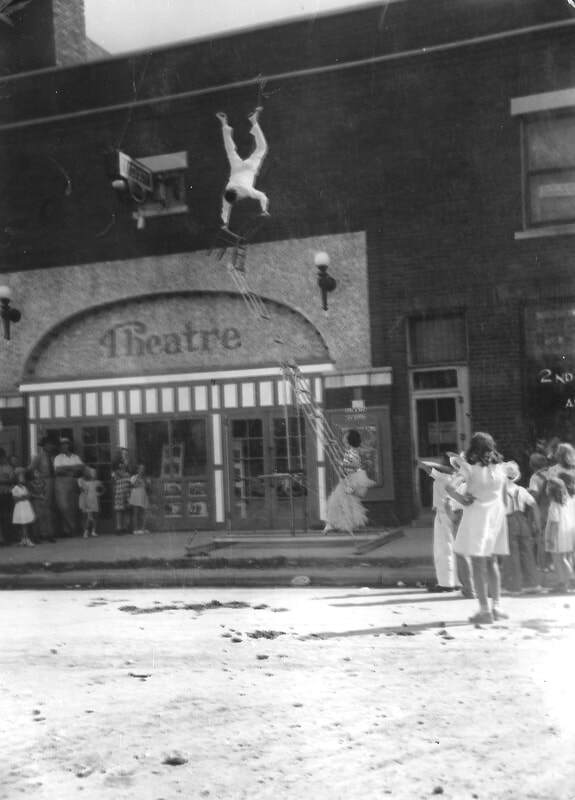 A fire started in the Theater on February 28, 1930. 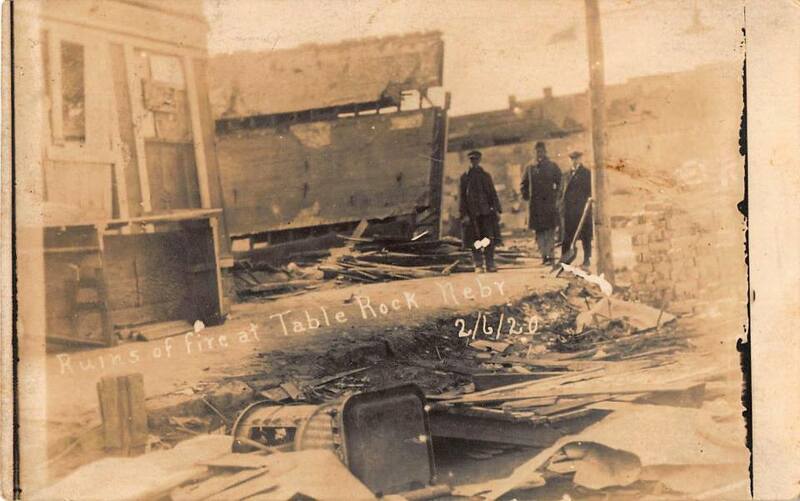 Losses were heavy, with the screen and curtains destroyed. 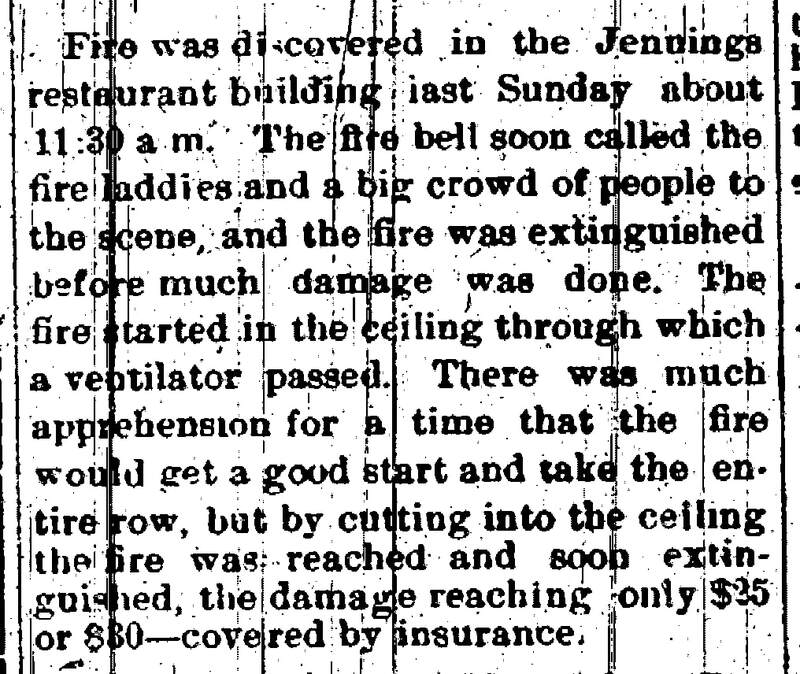 There was great smoke damage to all of the rooms in the adjoining hotel as well. 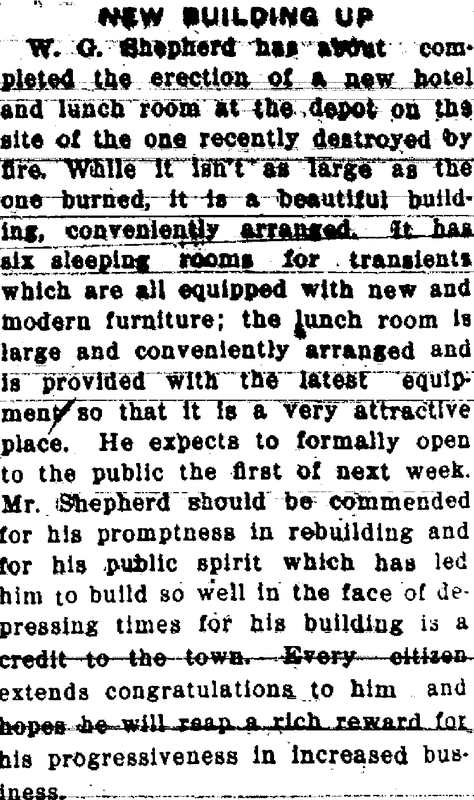 On March 6, 1931, the Hotel Murphy burned down. 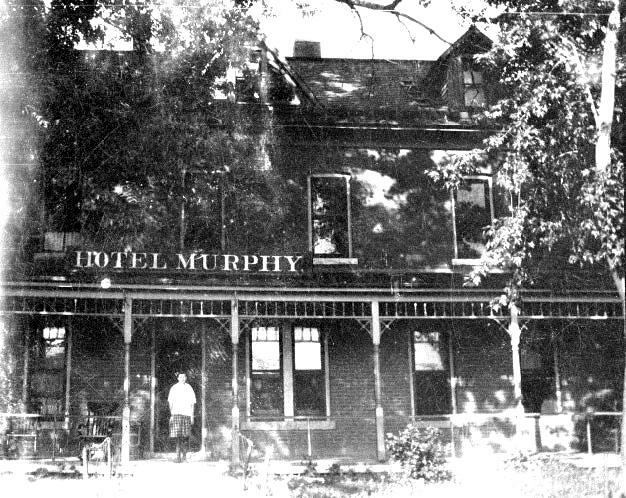 The Murphy Hotel was a beautiful, grand railroad hotel. 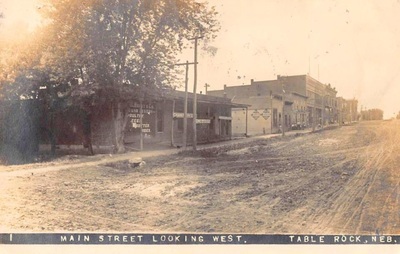 It was approximately where the Reno Inn is now. When was it built? 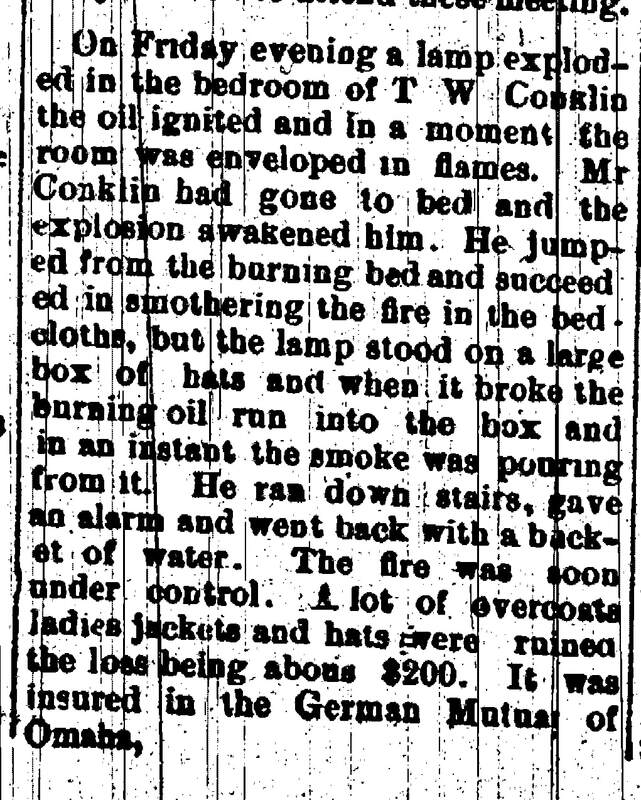 An article about the fire gave the history of the hotel and said that it had operated "with the coming of the railroad." 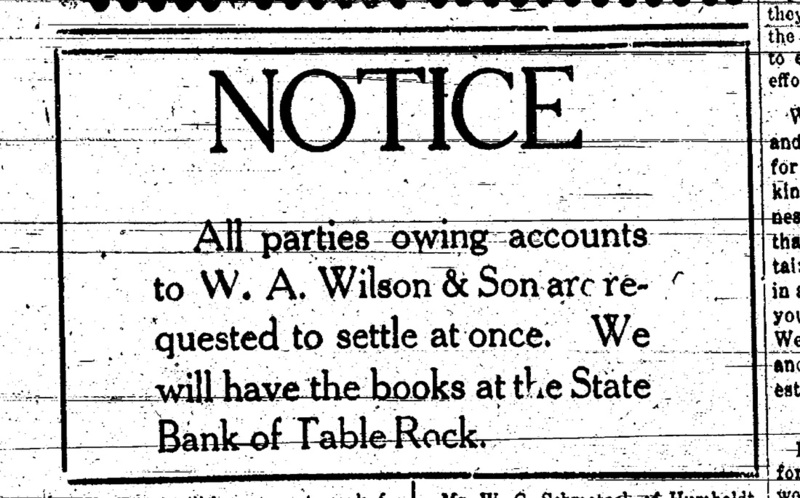 The railroad came in 1871. 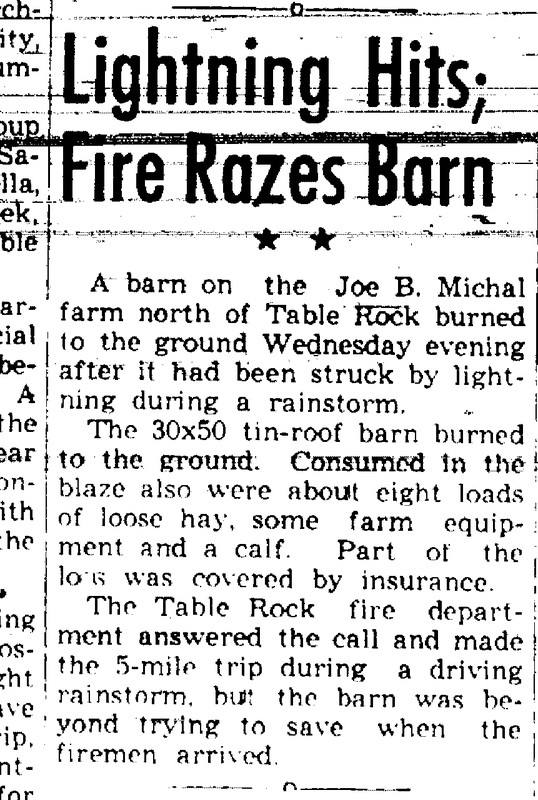 It was thus probably 70 years old at the time of the fire. The Hotel Murphy burned on Monday night. 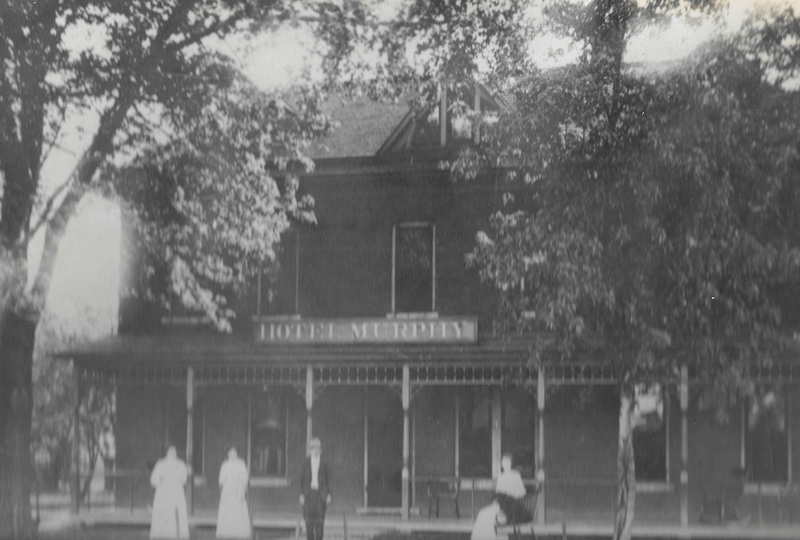 The son of the owner of the Hotel Murphy owned a cottage behind the hotel. The day after the hotel fire, the cottage burned down, too. Photo 243 - some members of the Shepherd family at the hotel.